February 2015 n Performance & Hotrod Business n 25 Monyhan recommends plenty of TLC. "Take care of your tools. Don't just toss them into the toolbox and let them rattle around, banging against each other," he says. "Take the time to properly store your tools so they will maintain their accuracy for their intended use." And Stewart advises shops to keep things organized and close at hand. "The number one tip we have for shop owners who want to maximize the ben- efit of professional tools is to keep tools easily accessible. Often, technicians may be tempted to grab the tool that's closest, but it might not be best for the job. With all tools easily accessible, identifying the correct tool for the job becomes easier." Things to Avoid A big part of the time-equals-money equation is avoiding mistakes, so we asked about areas professionals should avoid when it comes to using, storing and/or caring for their specialty tools. Goodson's Monyhan tells us a sure way to sudden death for a tool: "Loaning them to an untrained associate/person." Malco's Janey gives us another ever- green basic worth repeating. "Not working clean and organized can be a big, expensive problem," he says. "Keeping tools off the floor and cleaning up the work area and cleaning and storing tools for the next job are quality and time- saving practices that protect your quality, time-saving specialty tools. A dedicated, dry, clean tool storage space also extends tool life and helps avoid tool loss or theft." 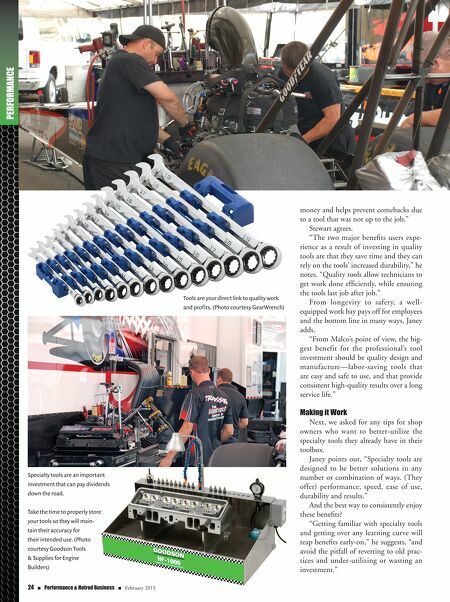 After all, notes GearWrench's Stewart, your tools are your direct link to quality work and profits. "The biggest mistake professionals tend to make when using or storing their tools is simply not taking care of them the way they should. Using the tools properly and periodically cleaning and inspecting them can help avoid shortening the tools' life." Maximizing ROI Lastly, what can professionals do to ensure they get the most return on invest- ment from their specialty tools purchase? Stewart says to "invest in quality." "These tools will save time by consis- tently getting jobs done more efficiently," he explains. "It's important to remember that even small efficiencies add up and will make your business more profitable in the long run." Janey says to "squeeze every dime's worth of productivity out of your specialty tools by making maximum use of them and caring for them like they were just new out of the box. That way, you won't have to shed so many tears when that fateful day comes when you have to replace them." 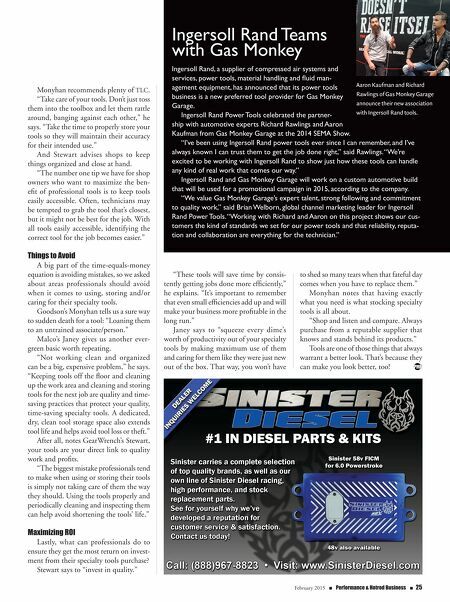 Monyhan notes that having exactly what you need is what stocking specialty tools is all about. "Shop and listen and compare. Always purchase from a reputable supplier that knows and stands behind its products." Tools are one of those things that always warrant a better look. That's because they can make you look better, too! Ingersoll Rand Teams with Gas Monkey Ingersoll Rand, a supplier of compressed air systems and services, power tools, material handling and fluid man- agement equipment, has announced that its power tools business is a new preferred tool provider for Gas Monkey Garage. Ingersoll Rand Power Tools celebrated the partner- ship with automotive experts Richard Rawlings and Aaron Kaufman from Gas Monkey Garage at the 2014 SEMA Show. "I've been using Ingersoll Rand power tools ever since I can remember, and I've always known I can trust them to get the job done right," said Rawlings. "We're excited to be working with Ingersoll Rand to show just how these tools can handle any kind of real work that comes our way." Ingersoll Rand and Gas Monkey Garage will work on a custom automotive build that will be used for a promotional campaign in 2015, according to the company. "We value Gas Monkey Garage's expert talent, strong following and commitment to quality work," said Brian Welborn, global channel marketing leader for Ingersoll Rand Power Tools. "Working with Richard and Aaron on this project shows our cus- tomers the kind of standards we set for our power tools and that reliability, reputa- tion and collaboration are everything for the technician." Aaron Kaufman and Richard Rawlings of Gas Monkey Garage announce their new association with Ingersoll Rand tools.